Is it possible to add monitoring for this parameter? 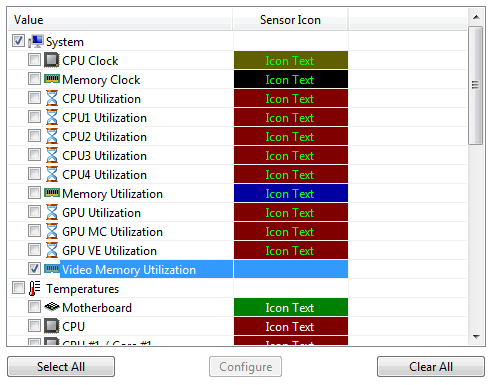 AIDA monitors CPU, GPU and RAM utilization in percents, but for the Dedicated Graphic memory it shows only using in MB. It would be very useful to see GRAM utilization in percents. I'm afraid so far we haven't found a reliable method to monitor GPU video memory utilization percentage. It's a pity I hope you will find some way to implement this functionality. But what is the problem? AIDA shows GRAM size and shows the used GRAM memory in MB. Looks like that it is easy to calculate a percentage of the used memory. It's not that straightforward, since detecting video memory size and detecting used memory works very differently. And when a video adapter uses off-board memory as well (UMA, HyperMemory, TurboCache, etc), then the video memory size detected by AIDA64 may not equal to the actual total video memory available for the GPU. Looks like the two last params show used\free physical graphic memory. But what do the GPU dedicated memory and GPU dynamic memory show? Used Video Memory and Free Video Memory are detected using NVAPI, the proprietary software interface for nVIDIA ForceWare video drivers. Hence that info is only available on GeForce video adapters. GPU Used Dedicated Memory and GPU Used Dynamic Memory are detected using D3DKMT calls, and so they are video adapter manufacturer independent. They represent the dedicated (on-board) memory usage, and the dynamic (off-board) memory usage. Dedicated memory is the amount of video memory allocated statically by the video adapter. It is mostly the video memory soldered on the video card PCB. Dynamic memory however may be dynamically allocated from the system memory, to expand the amount of video memory. Dynamic memory is also the UMA memory used by IGP and APU chips. Please note that D3DKMT is an unofficial and undocumented interface, and NVAPI is a properitary non-public interface. Due to the manner of those interfaces they are not documented, not explained by their inventor or designer, and so it's not easy to know anything 100% accurate and specific about the values they provide. Is it accurate on all Nvidia adapters? If yes, maybe you can add the video memory utilization parameter when a Nvidia card is detected. Thank you very much! I think it works fine. It's very respectfully that you consider requests from people. Fiery, one thing. This item has appeared in the Sensor Icons item in the Preferences but it can't be configured and it doesn't have an icon so it isn't shown in the tray (but it's always checked). And one problem in this forum: attached image isn't clickable in the Post Preview. Thank you, we'll fix that in the next AIDA64 beta release. It works fine in IE 9.0 and Chrome 17 for me. What web browser do you use? I'm using Firefox 10.0.2 now. Just verified and it doesn't work. Click More Reply Options, attach some image, click Preview Post and try to preview your image. Mouse pointer changes to 'hand' when covering the image but clicking doesn't do anything.